banaras ka khana: murgh safaid qorma : a white stew with chicken and almond paste..
murgh safaid qorma : a white stew with chicken and almond paste..
Safaid qorma or safed korma or chicken or murgh safeda as it is called in Banaras, this delicately flavored chicken stew is easy to make and creates a stir every time I cook it. Actually all the white curries we make are very curiosity inducing among the guests and extended family. While many light colored curries are popular in UP, all of them using some or the other kind of nut paste as a base, a pure white curry is something people keep coming back to. Second and third helpings are normal as the stew is not spicy as well. Very delicate flavors or spices used and a rich broth of chicken make this stew quite interesting. Although I would suggest to serve this stew along with some more spicy side dishes, at least a spicy raita or green chutney and raw onion slices if you are cooking it as a routine homely meal, we prefer this stew with just warm fluffy home baked naans. Yes, there is no additional oil used in this stew. All the fat me from the chicken, the nuts and the full fat milk used. Put everything under the simmer together list in a deep wide pan or stock pot and simmer for about 1.5 hours. There will be a lot of scum during this, you can remove it if attending the simmering pot or let collect on the top. Keeping the pot half covered makes sense or just place a loosely fitting lid over it. Mean while, peel all the almonds and make a nice smooth paste adding the milk if required. Add the nutmeg and cinnamon powders to this paste and blend once more to incorporate. Keep this paste aside. Remove all the chicken pieces from the simmering broth and put them all into a kadhai, removing any scum if it get stuck to the pieces. Now strain the stock over the chicken pieces and discard all the scum and whole spices that collects into the strainer. This is a trick to get a clear smooth and pure white gravy for this stew. Now add the almond paste and the milk, adjust seasoning by adding salt if required and simmer for 5-8 minutes more. Serve hot or warm with your choice of accompaniments. We have served this stew with biryanis, with naans and with an elaborate meal many times and the chicken safaida was appreciated well by the guests every single time I cooked it. The stew is very lightly spiced but you can adjust the spiciness to your taste. I make it a point to adjust the heat into this stew according the preference of people having it. Adding some white pepper powder, some yellow chilly powder and simmering a few slit green chilies in the first step helps getting some heat into this stew. But we like it the way I cooked this time. Do let me know if you try this chicken safaida. I have posted a mutton safaida or gosht safaida as well and that is a frequently repeated recipe at my place too. 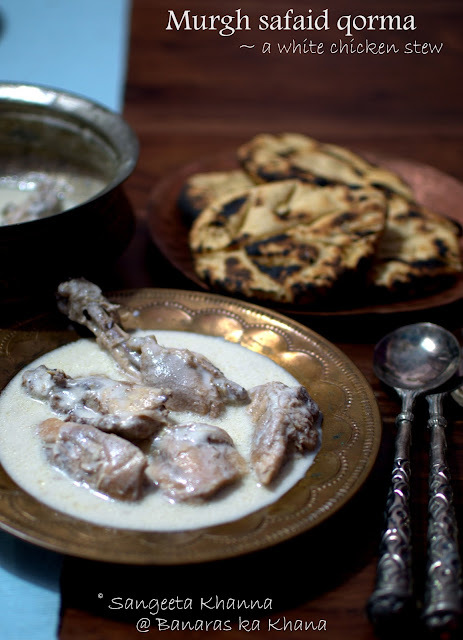 Another whitish curry called chicken rezala is also a white chicken stew, another chicken stew mughlai style is whitish but way different from this one, and a chicken in a creamy white gravy. All these are favorites, but get made according to what we are planning on the side. Try all of these and see which one you like. You can always cook these curries with vegetarian options too, paneer and lightly fried cauliflowers will be wonderful in this curry I feel. YUM! I can't get enough of the mutton ishtoo, and now you post this. Looks YUM! Love the rotis in the background too. Sangeeta, i love this & will make it! but a lot of my fammily is vegetarian & i am wondering how to change the ingredients? would you suggest changing chicken to paneer/ veggies? what other items would change to make this flavorful? Thank you Sangeeta, this looks yummy! I am going to make it. but a lot of my family is vegetarian. can i change this recipe somehow to make it vegetarian? thanks! yes you can cook this stew with any vegetables or paneer or a mix of vegetables like beans, baby corn, chery tomatoes, green peas, cauliflowers etc.